Who said being a freak meant that you have to be cold? 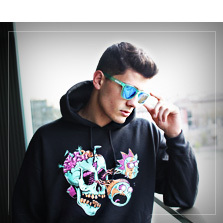 If you believe that it means that you haven't seen the geeky hoodies collection from Funidelia. We have the greatest catalogue of jackets, tunics, and geeky jumpers from the themes you like the most. The most original and fun geeky merchandise hoodies for you or to give to whoever you want. 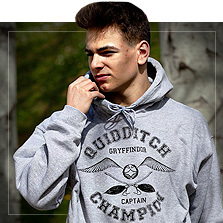 Hoodies for men and women in all styles from your favourite movies, TV series, videogames and music. 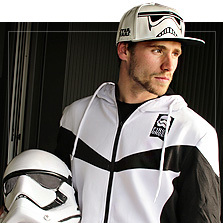 We have the most original Star Wars hoodies and most fun Rick & Morty hoodies. 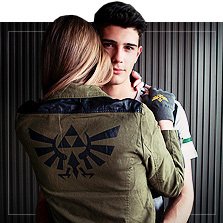 But we also have jackets, jumpers and hoodies from popular video games such as The Legend of Zelda, Pokemon, Assassin's Creed or Super Mario Bros. So that the whole world knows you are an authentic fan! 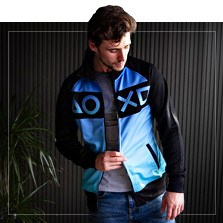 Choose the nerdy hoodie, jacket or geeky jumper that you like the most, now! Includes: knitted jumper with a picture of Captain America's shield. Includes: knitted jumper with a picture of Deadpool. Includes: black and orange hoodie with hood and zip. With pattern and logo on the chest. 100% polyester. Includes: Hoodie with printed logo on the chest and on the back. If you have named your son Luke just to be able to say "Luke I am your father", or if for you "Eleven" is more than just a number, if your owl got lost on the road and you haven't received your letter to Hogwarts, if you say "Wubba Lubba Dub Dub" every time you need help or if you say "Winter is coming" when you feel cold... these geeky hoodies are for you. Gotta catch em' all! At Funidelia you will find the most original hoodies and official merchandise from your favourite films, series and videogames. 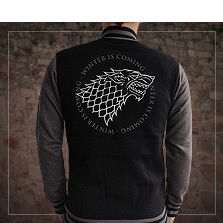 For him or for her we have the most fun jackets and geeky jumpers for the pleasure of true fans.